Dr. Gonzalez is a second generation native of El Paso, TX. He returned to El Paso after being gone nearly twenty years to pursue his education. 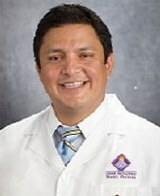 Dr. Gonzalez received his medical degree from Stanford University School of Medicine. During his time at Stanford he was selected to participate in a year-long clinical research fellowship at the Mayo Clinic in Rochester, MN under the direction of Dr. Shawn O’Driscoll. He was a member of the Cartilage and Connective Tissue Research Laboratory and studied the role of various signaling factors involved in cartilage growth. Following graduation, he continued his orthopaedic surgery training at the University of California, Los Angeles (UCLA), one of the premier programs in the country. Following completion of his orthopaedic surgery training at UCLA, he was selected to participate in the Shoulder and Sports Medicine Fellowship Program at Harvard Medical School/Brigham and Women’s Hospital. He gained excellent training in the management of complex sports medicine related injuries under the tutelage of Doctors Laurence D. Higgins and Scott D. Martin. The program emphasized non-operative and operative management of patients with complex shoulder, hip, and knee injuries, and treatment of patients with cartilage damage, ranging from isolated cartilage defects to advance arthritis. He participated in the care of a diverse patient population ranging from the weekend warrior to the professional athlete. Upon completion of his fellowship at Harvard, Dr. Gonzalez began his second fellowship in adult hip and knee reconstruction at Emory University Orthopaedic and Spine Hospital in Atlanta, GA. Under the direction of Doctors James Roberson, Greg Erens, and Thomas Bradbury, he gained expertise in the treatment of complex hip and knee problems. During this year he became proficient in revision (re-do) hip and knee replacements and anterior hip replacement surgery. Finally, before leaving Atlanta and returning home to El Paso, Dr. Gonzalez participated in an apprenticeship under the direction of Dr. Xavier Duralde, a nationally and internationally recognized shoulder and elbow specialist and head orthopaedic surgeon for the Atlanta Braves. This training opportunity allowed him to participate in the management of sports related shoulder and elbow injuries. Dr. Gonzalez’s approach to patient care is simple. His goal is to provide comprehensive musculoskeletal care of the highest quality, with personalized attention to every patient. He believes listening to and developing a partnership with his patients leads to an accurate diagnosis and optimized recovery process. A knowledgeable patient will make the best decisions about their treatment. With every patient, he feels it is important to explain how the condition developed and the treatment options available, both surgical and non-surgical. Emory University, Goizueta Business School - Master of Business Administration.